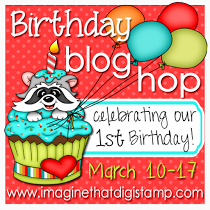 HIP HOP HIP HOP HIP HOP.......no its not the Easter Bunny.....its the Imagine That Design Team celebrating with a BLOG HOP!!!! You really need to participate because there are some really great projects and wonderful prizes to be won! 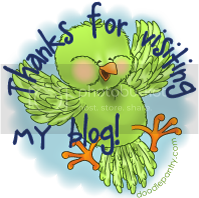 If your on the blog hop then you just arrived from Jerusha's blog. If you just landed here from space and are wondering what you should do then start HERE. I have a secret letter for you to collect but I must admit I am not good at keeping fun secrets,......not at All...I know that Imagine that is a very nice place to shop, they have a fabulous store owner and they are having fun blog hop......so I am thinking that D....D.....D....D, just might be what you are looking for. 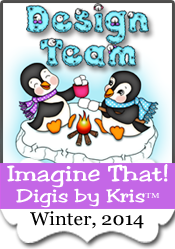 There are so many new sets that Kris has developed for this Birthday Bash! Pick one, Pick two, well if you want pick them all because they are just so darn cute! Here is a project I created with a new set from the store. Isn't he just the cutest little BirthDay bear you ever did see? I colored him with Prisma colors. I have noticed that I go through phases....sometimes I use pencils a lot and other times its copics. Your next stop is the wonderful Barb- she always has the cutest projects!! Happy Hopping!